Fall has finally officially arrived (though it doesn’t feel like it yet here in Texas). It seems like everyone we know is immediately in pumpkin mode as the season changes from summer to fall. Pumpkin decorations – indoor and outdoor, pumpkin recipes, pumpkin beverages, and maybe even a pumpkin costume for the holiday around the corner … Oh my! 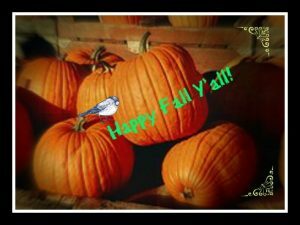 We definitely enjoy good pumpkin recipes around here – pumpkin pie, bread, muffins, cheesecake, roasted seeds, lattes, and more. So today we’re sharing an easy pumpkin pie recipe made with homemade pumpkin pie spice (no need to rush out and buy a new spice for the cabinet). First, let’s mix up the pumpkin pie spice, so it’s all ready to use in our pumpkin pie. We’re going to gather up and mix together 1 tablespoon ground cinnamon, 2 teaspoons ground allspice, 1-1/2 teaspoons ground ginger, 1/4 teaspoon ground nutmeg, and a pinch of ground cloves. Stir all this together until well combined and store in an airtight container. For the crust, we’ll mix together 1-1/2 cups of flour with 1/2 teaspoon salt. Then we’ll use a pastry blender or fork to cut in 1/2 cup shortening until pieces are small pea-size. Sprinkle 1 tablespoon water over the mixture and use a fork to gently combine. Push the moistened mixture to side of bowl and repeat with another tablespoon of water (using between 4 and 5 tablespoons of water in total) until all is moistened and a stiff dough is formed. Set aside in fridge, covered, until ready to use. Now for the super easy part. (Preheat oven to 425 degrees F.) We combine a can of pumpkin with 2 eggs, then add 3/4 cup sugar, 1/2 teaspoon salt, 1-1/2 teaspoons of our pumpkin pie spice, and mix thoroughly. Stir in 1 and 2/3 cups evaporated milk until well combined. Remove pie dough from fridge. Lightly flour a smooth surface, and flatten dough out with hands, then roll dough out from center to edges, forming a circle that is about 12 inches in diameter. Wrap pastry gently over rolling pin and place pie crust into a 9-inch deep dish pie pan, being careful not to stretch pastry as you place it in the pan. Trim the pastry to 1/2-inch beyond edge of pie plate, folding under any extra pastry. Pinch edges with thumb and fore-finger for a fluted edge. Pour pumpkin pie filling into prepared pastry crust and bake at 425 for 15 minutes. Then reduce oven heat to 350 degrees F and bake for 45 more minutes (if crust edges start to brown too much, tear some aluminum foil into strips and gently lay over crust edges -or use a pie crust shield – to protect them from further browning as the pie bakes). The pie is done when it slightly jiggles in the middle when bumped; if it looks done, it probably is. If it is starting to crack in the middle, it’s been in the oven too long (though topping it with whipped cream can fix almost anything, right?). When cooled, serve with a dollop of whipped cream and enjoy! P.S. If you don’t use a deep-dish pie plate for this pie, you will likely have extra filling left over – you could use any extra crust scraps and filling to make mini-pies in a mini-muffin tin! 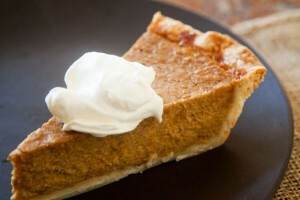 (See the detailed Pumpkin Pie and Pie Crust recipes). Are all your pumpkin or holiday recipes in one place where you can find them? If not, we can help! 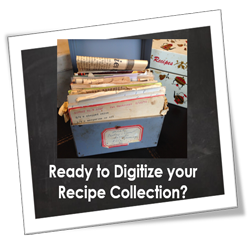 Set up your free recipe box here at Dish Dish and store unlimited recipes online for easy access, making a shopping list, planning menus and sharing with friends and family. Disclosure: This article may contain affiliate links.